What is the NWGN Plätzchen Backen competition? The NWGN Plätzchen Backen competition is a great way of getting your pupils in the Christmas spirit and introducing them to some German traditions at the same time. The German-speaking countries take Christmas baking very seriously and have a wide variety of Christmas cookies, special breads and cakes, for example the famous Stollen and Lebkuchen. The NWGN Plätzchen Backen competition encourages German classes across the North West to have a go at baking Plätzchen from German recipes and organise their own “Great German Bake Off”. Pictures of the event and the winning entries will then be sent to us together with the evaluation sheets and a NWGN jury will then determine the overall winners. Great prizes are to be won! What will a NWGN- Plätzchen Backen event look like? In groups or individually, pupils bake some Plätzchen following a German recipe at home and bring them into school on a set day. There will have to be a jury of two independent judges who will evaluate the baked goods using the NWGN-evaluation sheet (this can be teachers or older students). Please don’t forget to take a lot of pictures of the Plätzchen and of the event itself, as they will have to be handed in for the NWGN-competition. Then, the winners are crowned and everyone is welcome to enjoy the Plätzchen. The exact set-up and any accompanying tasks are up to you – in our teacher pack, we made some suggestions. J All you have to do then is to send pictures of the event and of the winning entry to us, and a panel of jurors will decide on the overall winners in the North West and send out the prizes in early January, when school starts again. What can and has to be done in preparation to the NWGN-Plätzchen Backen event? The deadline for signing up is the 6th December 2017. We will then send you a teacher pack containing some recipes (in easy German), some Christmas Plätzchen activities to use in class, advertising posters, and some stickers for prizes to reward really committed pupils. You will have to summon two judges for the competition (it can be yourself and another teacher, some older students or really anyone who is not a contestant) and print enough evaluation sheets. You might also want to source some smaller awards or prizes for the winning entries. The winning entries that are passed on for the NWGN Plätzchen Backen competition must be baked following a recipe that comes from a German-speaking country, so it might be a good idea to make students bring along the recipe they have used. After the event, just send us some pictures of the event and winning entries (contact details will be enclosed in the teacher pack) along with the completed evaluation sheets to give the jurors a better impression. We will take care of the rest. The set-up of the competition is entirely up to you – you can hold the event in class or outside class. 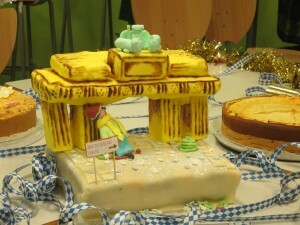 You can award prizes or just have a nice time together eating Plätzchen and exploring German (food) culture. How do I sign my class up? How will the NWGN support us? We will provide you with some ideas about how to organise your Plätzchen Backen competition event and also some teaching materials and recipes. The recipes will be in easy German, so the students can use them as they are. They are also free to research their own recipes, as long as they come from a German speaking country and are in German. We are also happy to answer any questions you might have along the way and support you the best we can. We will award the best entries with special prizes, which will be sent out in early January 2018. What are the ground rules of the competition? Eligible are learners of German at any level of Secondary School. You have to be signed up by the 6th December to take part. Judges have to use the NWGN evaluation sheets. Photos of the event, the winning entry and its completed evaluation sheet(s) (provided in the teacher pack you receive when you sign up) have to be emailed to the NWGN no later than 22nd of December, 23:59.